I am pleased to announce my joint July 4 recipe post with my very good friend Bee who runs the #1 Malaysian and Asian recipes website on the Internet. Several years ago, I was pleasantly surprised to run across Bee Yinn’s recipes and Rasa Malaysia website while looking for authentic Malaysian recipes. As another transplanted immigrant from the tropical island of Penang just off the Malaysian peninsular, I’ve embraced America as my new home by learning to love and cook a wide variety of American comfort foods while living in Texas and now California. It was love at first barbecue bite for me when I tasted BBQ brisket while attending Texas Tech U in the mid-1980’s. In 2008, I made my first foray into competition BBQ after a co-worker suggested I enter a contest after being inspired by the 2008 movie The Bucket List starring Jack Nicholson and Morgan Freemen. Long story short, in four years, I’ve become one of the top-ranked BBQ pitmasters in America having won 20+ grand championships, California and Arizona Team of the Year, and numerous national awards. I’ve also appeared on a reality TV show called TLC’s BBQ Pitmasters Season One in 2010. In that show, I was the underdog team from California pitted against six other BBQ teams, including two world champions, from the Texas, Georgia, and Virginia. In the Season Finale episode 8, Slap Yo Daddy BBQ surprised the nation by defeating all the teams in the show including two BBQ World Champions in the winner-take-all Rib Throwdown in Texas. Bee Yinn and I enjoy collaborating on recipe ideas and for the July 4th Independence Day Holiday,] she asked me to suggest my favorite thing to cook on July 4th. That’s easy because the quintessential food that most Americans cook on Independence Day holiday are burgers. There are literally hundreds of burger variations which embrace the cosmopolitan nature of the American people and various diverse ethnic heritages. There are also many different types of meat and seafood that can be stuffed between two hamburger buns. My favorite burger is a simple classic cheeseburger with some twists that makes it extra special to share with loved ones. Let me start with the beef patty. I prefer to use organic beef which has a high fat content of at least 20% because fat imbues the burger with flavor. For the cheese, I like to use a veined Italian Gorgonzola which belongs to the blue cheese family of Gorgonzola, Roquefort, and Stilton. Gorgonzola is also wonderful when melted into sauces and used to thicken stews. 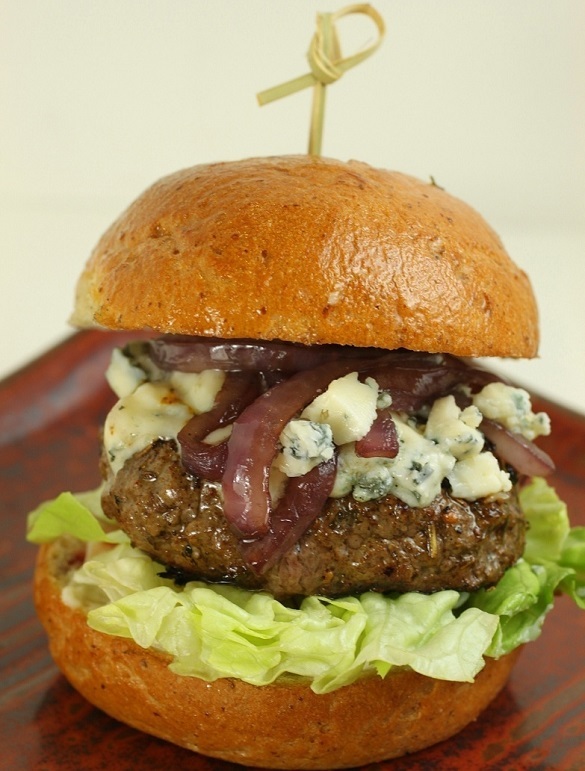 It’s quite strong so a little crumbled Gorgonzola on your burger goes a long way. When you have cheese, which is one of the great discoveries of humankind, you’ll need to have a wine pairing since cheese and wine are one of the oldest foods, 5,000 years BCE and 6,000 years BCE, respectively. For the wine, I like to use a Cab (from the small grape variety of Cabernet Sauvignon which has a deep color and flavor that pairs well with beef. 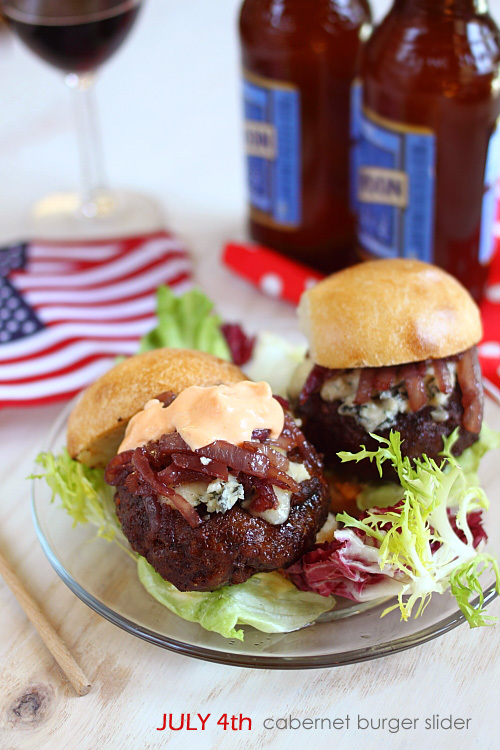 Instead of drinking the wine with my burger, I like to caramelize sliced onions with the wine and enjoy my burger with a good ale or beer. My philosophy is to keep my cheeseburger intentionally simple so you can taste the magical combination of beef, strong cheese, and hint of wine in the onions. Divide the 16 oz of beef into three portions of about ⅓ lb for each patty. You can use more beef and more buns to make enough for your party. 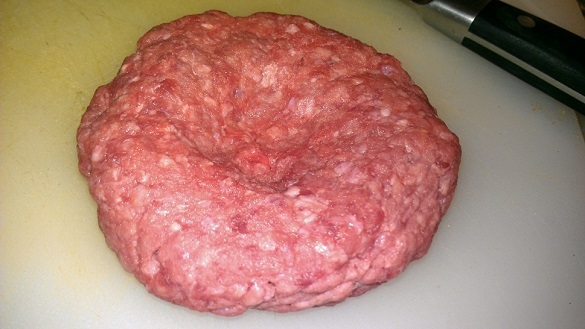 Shape each beef portion with your hands into a round patty about ½ inch wider in diameter than your bun. Make a depression in the middle of the patty. This will help ensure that the middle will not bulge out after cooking. Sprinkle with some SYD Hot rub on both sides and place on wax paper lined cookie sheet. Cover in plastic wrap and leave in fridge until ready to cook. 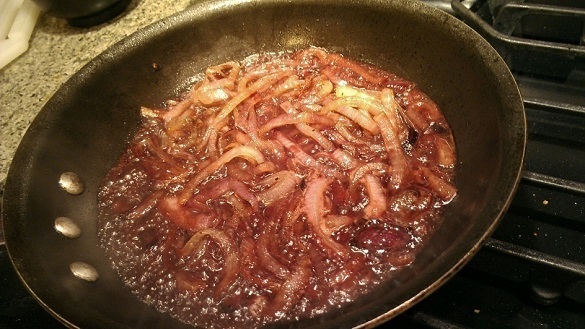 Cook the sliced red onions with 2 tablespoons of butter in a medium hot sauté pan. Season with some SYD Hot rub. Cook onions about 5 minutes if you like your onions less mush, or 15 minutes if you like your onions mushy like onion jam. Add the Cabernet and simmer until reduced to a syrupy liquid. Remove and set aside. Heat up your grill to 450°F or perform the hand test. The test is a measure of how long you can hold your hand 6 inches above the grill before withdrawing your hand. 2-3 seconds is equivalent to about 450°F. Ensure that your grates are cleaned and oiled before cooking to reduce sticking. Put patties onto the hot grill, close the grill cover, and wait until they develop a nice char (about 5 minutes). Some flaming is normal as the grease drips but if it flames excessively, move the patty to another spot where it is not flaming. After about 5 minutes, flip over and repeat to get a nice char on the other side. After char has developed on the second side, move the patty to a cooler spot on your grill and cook until internal temp is about 150 degrees or until there is no pink in the middle (I used an instant read thermometer). During the last minute of cooking, add some crumbled Gorgonzola cheese and wait until the cheese melts. Remove. Safety Note: with burgers, it’s advisable to cook until medium as there could be traces of Salmonella if eaten medium rare. Only cook medium rare if you ground the meat yourself from a whole piece of meat where you sliced off possible contaminated surfaces. Toast the inside surfaces of your burger buns on your grill. Remove once toasted and browned. Spread some spicy mayo on your buns, add greens of your choice on the bottom half, add your melted Gorgonzola beef patty, top with Cabernet onions, more spicy mayo, and the top half of your bun. Enjoy immediately with your favorite ale or beer.